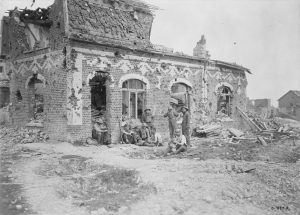 The destruction in Lens was immense, yet gutted houses like these could be fortified and turned into nests of resistance. Credit: Canada. Dept. of National Defence/Library and Archives Canada/PA-001862. With the success of the Canadian Corps at Hill 70, Currie now turned his eyes to the town behind the hill – Lens. Despite drawing out the Germans into a costly attack, and causing some 20 000 casualties, the capture of Hill 70 had not forced a German withdrawal from the city. Currie had originally planned Hill 70 to avoid having to make the Corps attack a fortified city, which they had no previous experience doing, but with no German withdrawal and increasing pressure from his high command Currie was forced to consider going into Lens. With input from his divisional commanders, Currie ordered the 2nd and 4th Divisions into the city in a narrow fronted, probing attack. The first attack took place at 4:35 am on 21 August with battalions from both divisions advancing from their lines to the outskirts of the city. They were met with extremely strong resistance, and in the maze of fortified cellars, ruined houses and block streets were continually harassed by the Germans. By the end of the day, the Canadians were forced to withdraw; they lost 1 154 soldiers in only one day. Currie now knew what was waiting for him in Lens – a strong German force – but made an uncharacteristic miscalculation. Rather than bombard Lens from above and avoid any inner city combat, he decided to send the 4th Division back in to try and capture Green Crassier, a large slag heap to the south of the city. 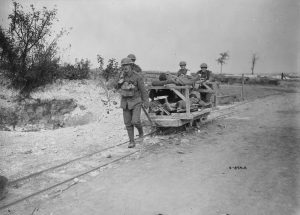 The 44th (Manitoba) Battalion was ordered into Lens on 23 August to try to take the Crassier, and while they managed to capture it initially, were left to hold it cut off from communications and without reinforcements. The 44th held out until the end of the day on 24 August but were forced to retreat and Curried called off the operation in Lens on 25 August 1917, ending the Battle of Hill 70. The city remained in German hands until the general German retreat of 1918. Total casualties for the Canadian Expeditionary Force during the period of 15 – 25 August 1917 were 9 198 killed, wounded, or missing. Credit: Canada. Dept. of National Defence/Library and Archives Canada/PA-001823. The fighting at Lens demonstrated a form of warfare that would take precedence in the Second World War; urban warfare. Capturing the city required the Canadian Corps to go through Lens street by street to clear out all remaining enemy forces, something which they just did not have the resources or the training to do. Lens was the last time the Corps fought in a city until Valenciennes in 1918. Full accounts of their lives and VC actions can be read by clicking on the hyperlinks in the men’s names. Corporal Filip Konowal (47th (British Columbia) Battalion) – An immigrant from modern-day Ukraine, over two days of fighting, Konowal was involved in clearing cellars in the city. He attacked two machine gun nests single-handedly, killing their crews and destroying their guns. He was awarded the Victoria Cross for his bravery, the only Ukrainian-Canadian to receive one. Konowal’s post-war life was tragic; his family in Ukraine was believed killed during Stalin’s collectivization plan in the 1930s Konowal himself was convicted of murder after coming to the aid of a friend in 1919. He was institutionalized and treated for physical and mental traumas of the First World War. Later released, he worked as a janitor in the House of Commons. Company Sergeant Major Robert Hill Hanna (29th (Vancouver) Battalion) – The second Canadian to receive a Victoria Cross during the attack on Lens. Both Hanna’s and Konowal’s VCs are counted as Battle of Hill 70 awards. 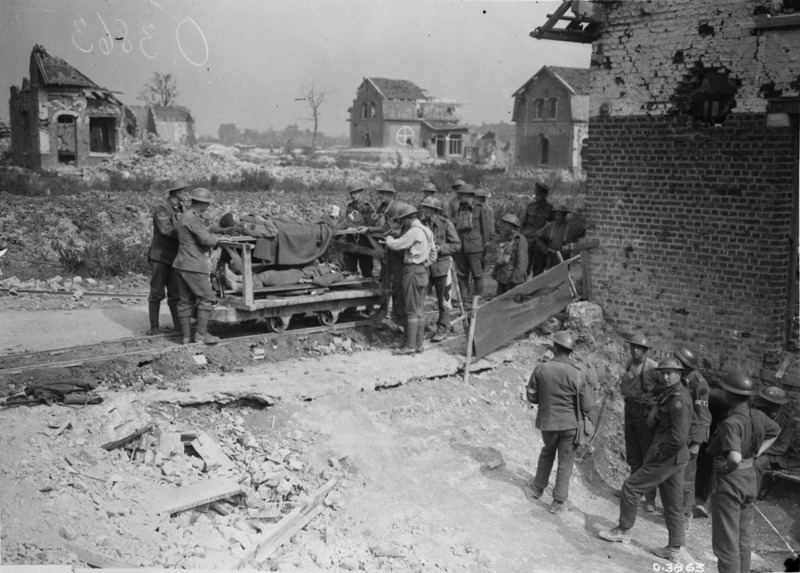 “A Canadian Doctor checking wounded Canadians before leaving an aid post near Lens. September, 1917.” (Note the large “cross hair” that has been marked on the house in the middle background). Credit: Canada. Dept. of National Defence/Library and Archives Canada/PA-003816.